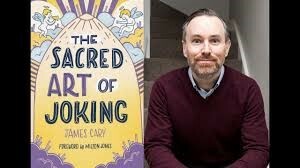 Our evening with James Cary will find him talking around his ideas about comedy in the bible. He has recently written a book entitled The Sacred Art of Joking, about how jokes can go horribly wrong, especially in the realm of religion. The devil may have all the best tunes. But does he have all the best jokes? Was Jesus funny? Why does religion have to be so serious? Award-winning BBC Comedy writer and stand-up theologian James Cary explains why Christians should be able to take a joke and how the Bible is way funnier than it first appears. Seriously. James has contributed to BBC shows like Miranda, Another Case of Milton Jones and Newsnight. In ‘The Sacred Art of Joking’, he delves into the Bible and finds that ultimately, the joke’s on us. James Cary has twenty years’ experience writing all kinds of comedy for BBC, ranging from mainstream hits like Miranda and My Family, and BBC Radio 4 shows like Hut 33 and Another Case of Milton Jones to CBeebies shows like Something Special and Gigglebiz. No stranger to controversy, James co-created Bluestone 42, a sitcom set in bomb disposal unit in Afghanistan. James hosts a podcast about comedy called Sitcom Geeks and has performed comedy at Spring Harvest, Greenbelt and The Brighton Fringe. He has also appeared on Newsnight (BBC 2), the Today programme (BBC Radio 4) and various BBC news programmes, often talking about comedy and offence. James is also a Christian, has a degree in Theology and is a member of the General Synod of the Church of England for Bath & Wells. Having written a column for Third Way magazine for over a decade, as well as stage shows The God Particle and A Monk’s Tale, he now co-hosts a podcast about the Church, the Bible and culture with Barry Cooper (Cooper & Cary Have Words).